Stirling will offer the best value salmon fishing in the UK next year at less than 55p a day thanks to a new permit for residents and visitors. Councillors have approved a range of exciting new measures to encourage anglers onto the shores of the Rivers Teith and Forth when fishing season begins on 1 February, 2018. Stirling Council Fisheries are now offering anglers spring fishing, sea trout fishing, summer fishing and back end fishing all on the one permit. The 2018 single annual season permit will now cover both the rivers Forth and Teith at a cost of £200, a drop of more than 50 per cent on the 2017 cost for a visitor roving permit. The new price is also a substantial decrease on 2017 resident roving permits (previously £296) and visitor season permits (previously £289). 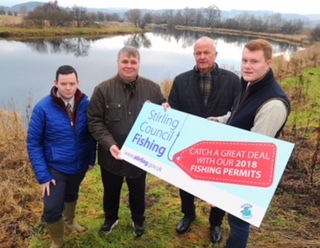 Also, three seasonal permits (spring, summer, autumn) will be available for those looking to fish the Stirling Council beats for only part of the year. The reintroduction of day permits in September and October, and the extension of the youth discount from 16 to 21, will also seek to increase angler numbers on rivers. Convenor of the Planning and Regulation Panel, Councillor Alasdair MacPherson, said, “Anyone who visits our shores will be able to experience some of the best fishing the UK has to offer, as well as embrace the local spirit of the angling communities surrounding our rivers. “The new permit price will allow a wider range of anglers than ever to access the beautiful rivers Teith and Forth. The opening celebrations of the Teith and Forth will take place in Callander on February 1st 2018.